I read my students First Day Jitters (Mrs. Hartwells classroom adventures) . 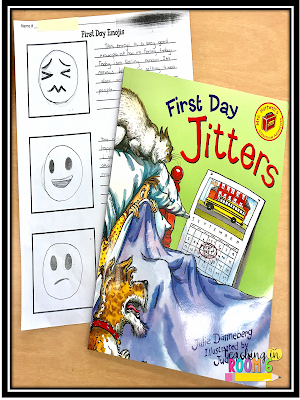 (affiliate link) In the story, the main character doesn't want to go to a new school on the first day because she is nervous. At the end of the book, we realize that the girl is actually the teacher. Even teachers get nervous! When the book was over, I shared how I was a little nervous about starting the day as well. I mean, what if the kids were out of control? What if they didn't listen? What if they hated me? But I also said that I was excited to meet them all. A new year means new possibilities and there was SO much possibility with my new class. Then, I shared that when I finally did meet them, and now that we were about 45 minutes into school, I was happy to know that the kids were amazing and inquisitive and funny. 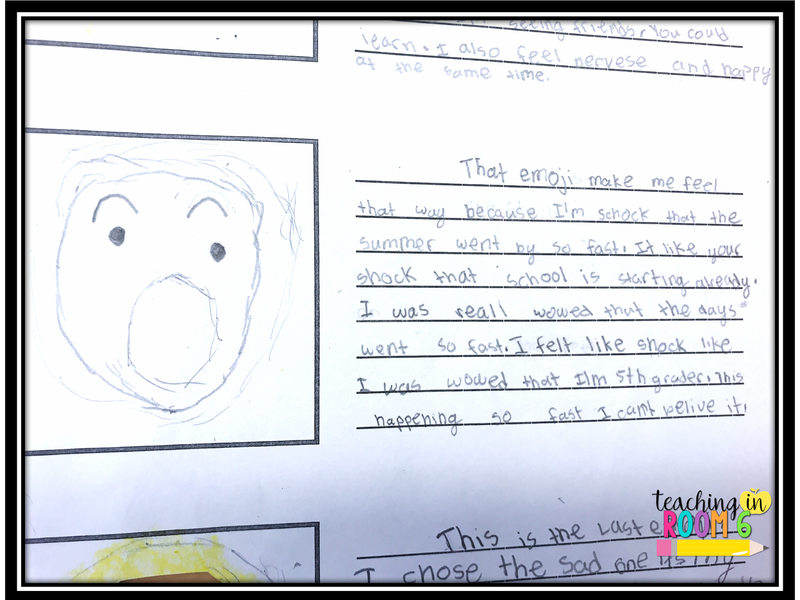 This lead into a discussion amongst the students about how they felt on this first day of school. I asked them to turn to their neighbors and share two feelings that they were having and why. After a few minutes of talk, I asked kids to share out. There were a great deal of emotions going around the rooms, and lots of great reasons for those emotions! The kids then headed back to their seats as I projected a full list of emojis onto the screen. I asked them to think about which emojis would represent their personal feelings about the first day of school. Now, the emojis I projected were yellow face emojis. I didn't let them choose anything in the emoji world, just the ones projected. I wasn't really looking to see the poop emoji on their pages! 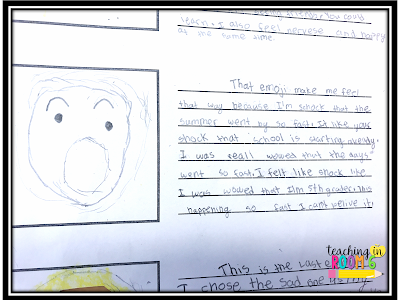 Once they picked the emoji, they drew it on a piece of paper, and wrote a paragraph (or a few sentences if that is all they could write) detailing what that emoji stood for and why it was a good representation of their feelings on the first day. Doing this enabled me to get a first day writing sample in a relatively stress-free setting. The kids were enjoying the emoji aspect so they weren't so worried about the fact that they were writing. Click here to get the simple form I used. 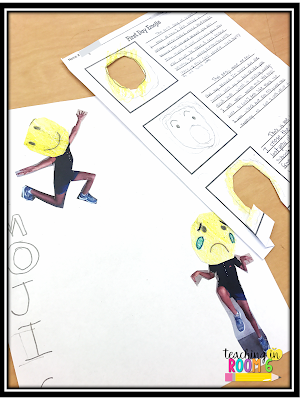 Then they cut out the emoji faces they drew, attached it to a picture of them that I took (I asked them to pose with their bodies so that they weren't just standing there) and rewrote the paragraphs as a final draft. They came out SO cute! I hung them on the wall and now we have a nice bulletin board to start our year off that is not only fun, but content based! 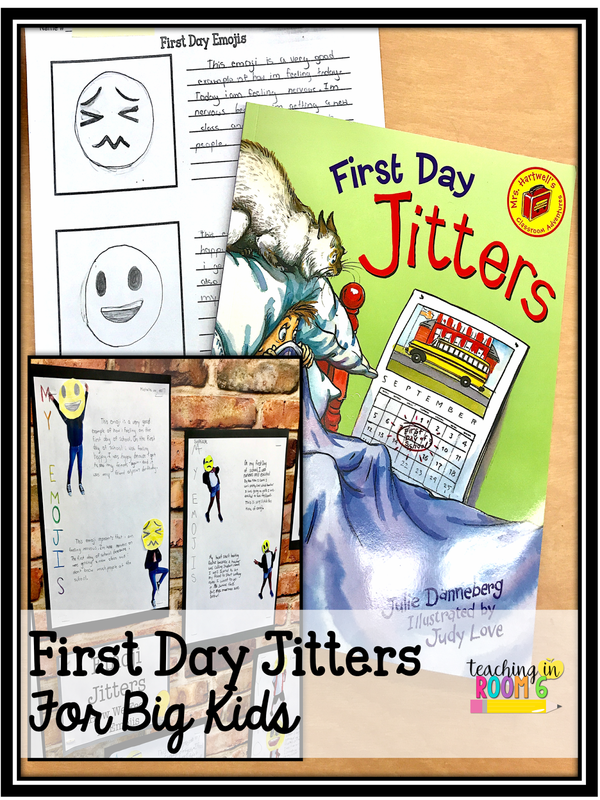 Have you used First Day Jitters (my affiliate link will take you to purchase the book) with your upper grade class? What are some ideas you have for how to use it with this age group? 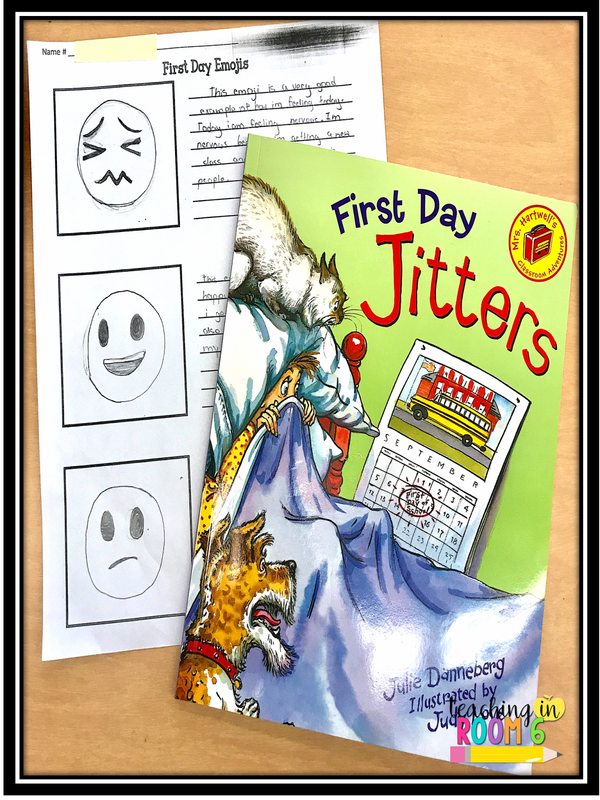 First Day Jitters is a great book and pairing it with Emojis and a little writing task is super! Who doesn't like Emojis? I read this book for the first time last year and we had a class discussion. 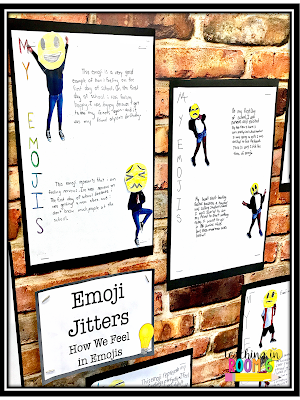 This year I will use your ideas because they connect well with our behavior management system (Zones of Regulation) and modeling/instructing the students on emotions and managing emotions. Love this idea! I am going to try it on the first day this coming school year. How many emojis did you project on the screen for the students to choose from?? Great idea. You have so many fun activities. Thanks for sharing. 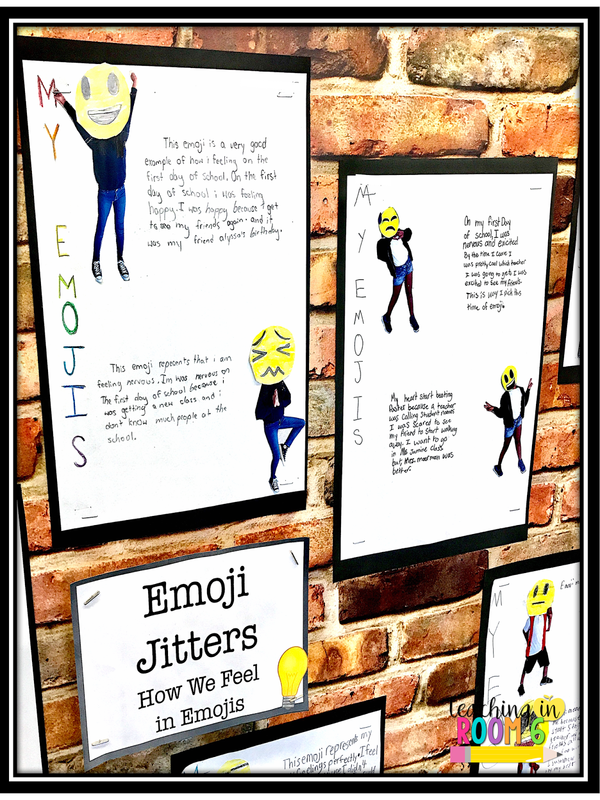 Love this book and using your emoji idea. Very fun idea, and I'm contemplating adapting it for my middle school reading classes this fall! This is great ! Do you have an emoji list you can share? I just did a google search for emojis in the Images section and projected the first big block I came across.